I really like the idea of 5-Hour Energy, but it’s not the best choice as a hangover cure. It tastes pretty good, but I don’t like the after taste very much. It’s extremely easy to use because you only need to take it once– no complicated directions! Unfortunately, drinking 5-Hour Energy didn’t take away my hangover, but did give me a little bit more energy. I really disliked the side effects. 5-Hour Energy made me feel jittery, shaky, and made my stomach even more upset. Overall, 5-Hour Energy might be better as an afternoon energy boost for people who aren’t sensitive to coffee, but it’s not the right “cure” for hangovers. 5-Hour Energy is very simple to use. It’s a 1.93oz bottle, which is pretty small and easy to finish. This product isn’t complicated to use at all, just drink it the next day when you have a hangover. Unfortunately, all the flavors I have tried leave the same gross after taste. I don’t like that part. I used 5-Hour Energy the morning after drinking. 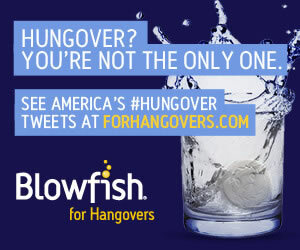 I didn’t have a bad hangover to begin with, but taking the 5-Hour Energy didn’t help me to feel any better. It did give me a little more energy, but for the most part the side effects only made my hangover worse. I think it’s because my stomach was already uneasy, and drinking this shot only upset it more. 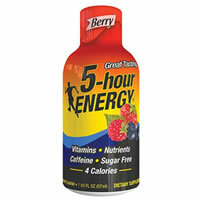 5-Hour Energy contains many B vitamins and energy essential ingredients. It contains a lot of caffeine. The shot is comparable to 12 ounces of the leading premium coffee. It also contains B12 which is a vitamin believed to help provide energy to the body. Another key ingredient is Malic Acid. Malic Acid is found in fruits and supposedly provides essential energy to the body during the process of converting carbs to energy. The biggest downside of this product is the side effects. I am pretty sensitive to caffeine from coffee, espresso, and energy drinks. My guess is that the amount of caffeine in the 5-Hour Energy is what made me feel almost worse then before I drank it. It gave me more energy, but made my heart race, made my body jittery/shaky, and upset my stomach. My body was already weak and dehydrated from drinking alcohol the night before, so maybe that’s why I the shot didn’t improve my hangover, but made me feel worse. It costs $25.49 for a 12pack of bottles. That works out to about $02.12 per serving. 5-Hour Energy is on the pricier end of hangover cures.